There’s something about going on vacation that just seems to shake the cobwebs from my imagination and open my mind to new ideas and inspirations. 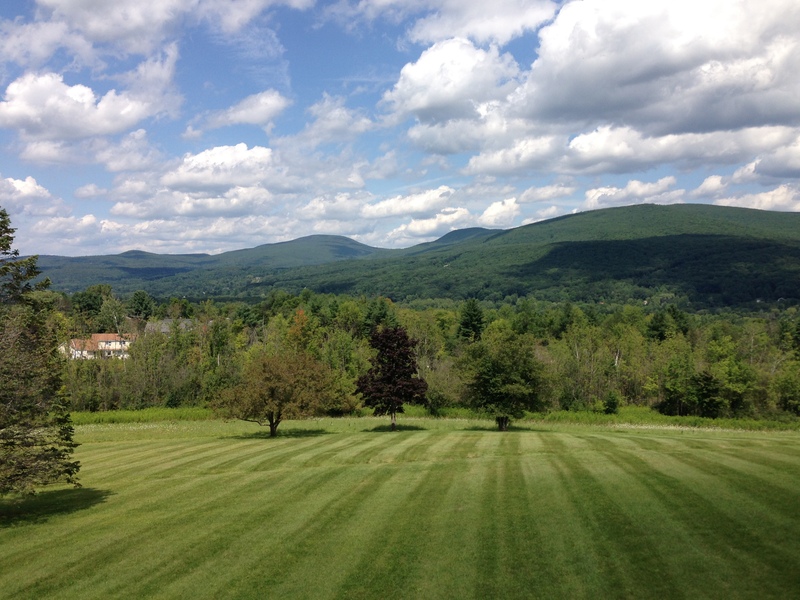 I blogged a great deal during my trip to Newport last summer, and this year we are encamped in the Berkshires, overlooking the campus of our beloved Williams College (I am a proud alum, as is my husband) and the so-called Purple Valley. And how could you not be inspired by this view? 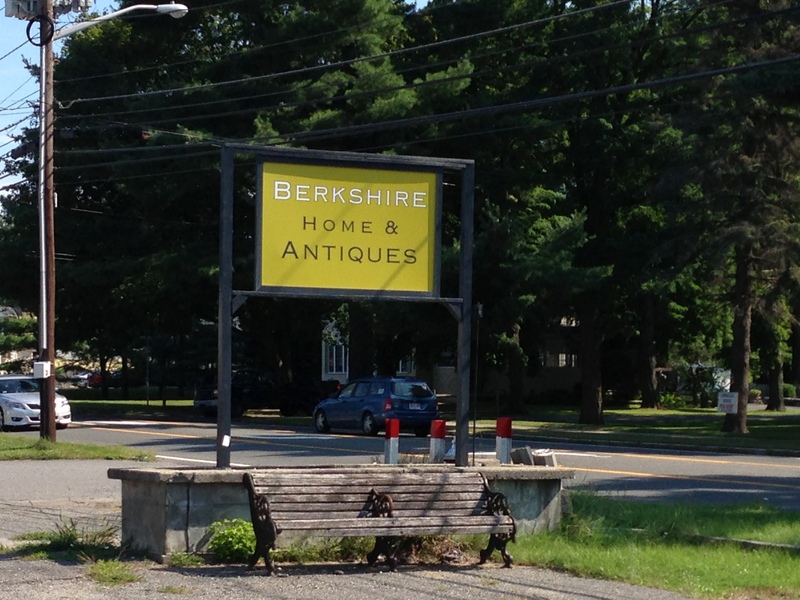 While we are staying in Williamstown, yesterday I made a much anticipated side trip with my mother to Great Barrington, just south of Lenox and Stockbridge, to visit Berkshire Home & Antiques. 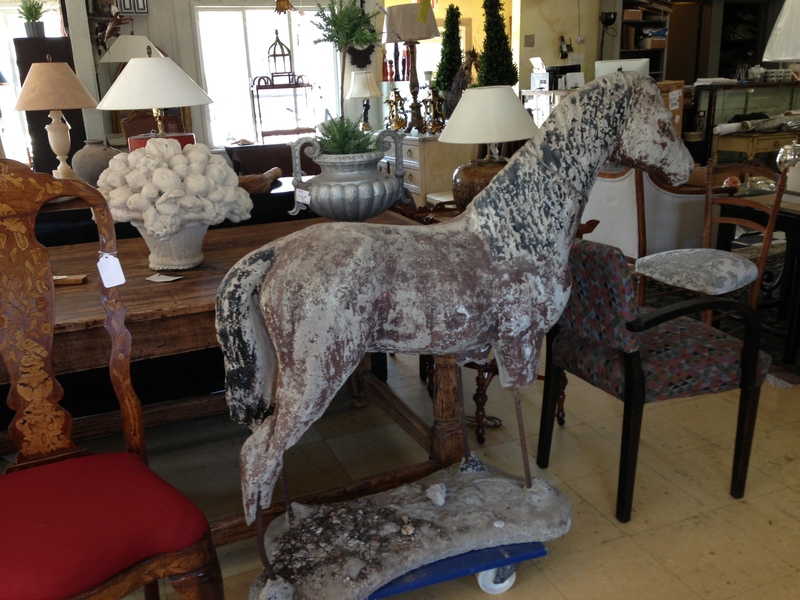 We met the delightful owner, Vivian Kimmelman, who has curated a fabulous collection of antiques, fine reproductions/adaptations, and custom furnishings in her sprawling brick-and-mortar store (not to mention her virtual one on 1st Dibs and, on occasion, flash sale sites like One Kings Lane). Rather than specializing in one particular style or period, Vivian fills her shop with unique and quality pieces – some of which need a bit of TLC, which they will gladly provide for you, to your specifications. It’s a designer’s – or a design or antiques enthusiast’s paradise in the part of this country that I consider my own little paradise: The Berkshires. I was especially charmed by this white Chinese Chippendale lamp table, which is in marvelous condition, and appears quite sturdy. A great way to add special, unique detail to your space – you can’t just buy a table like this at a furniture store! Speaking of Chippendale, this classic Chippendale-style arm chair from the 19th century made it onto my “thinking on it” list. With fresh upholstery on the seat, it would be just perfect. This style of furniture is tailor made for my 1895 Colonial Revival home, which is desperately seeking the authenticity and patina that only antiques can provide. And if an antique piece of furniture is still in good, sturdy condition today, it is a good sign that it will stand up to the beating children may inflict upon it in your home! 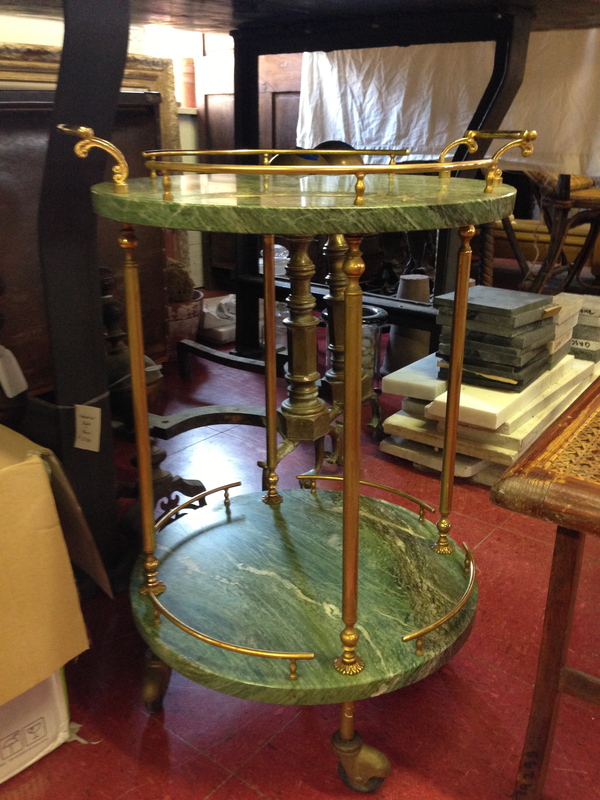 Also on my list, this gorgeous little side table-meets-bar cart, in green marble and unlacquered brass. 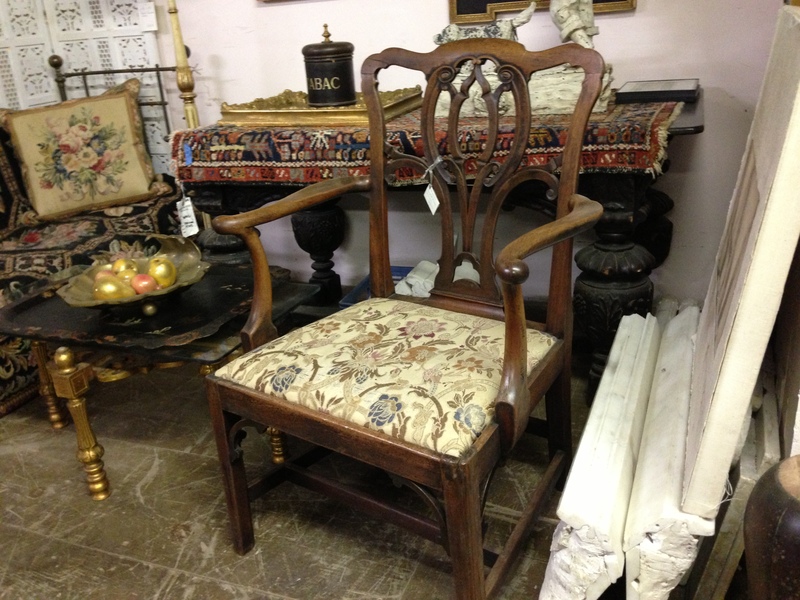 What a great piece for a small formal living room or sitting area (once upon a time: a “parlor”) where you need the flexibility of movable furnishings that are still refined and elegant. The little guardrails that prevent your cocktails from slipping overboard are genius! Ah yes, the unintentional selfie while photographing a mirror. 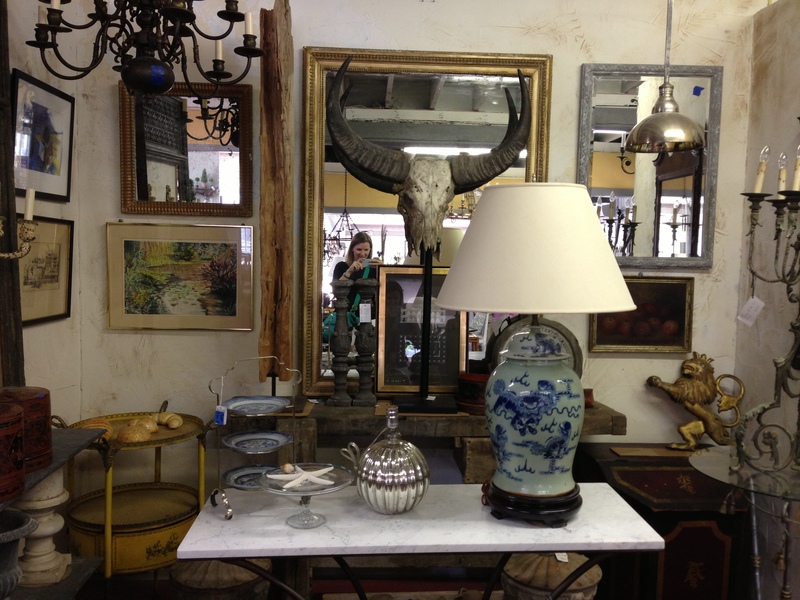 So many wonderful treasures here (and I don’t mean me), including the Chinese ginger jar lamp in the foreground, and that ram’s head on the mirror. I am a sucker for a great marble-topped console, too. Giddy-up! What a fun conversation piece, no? 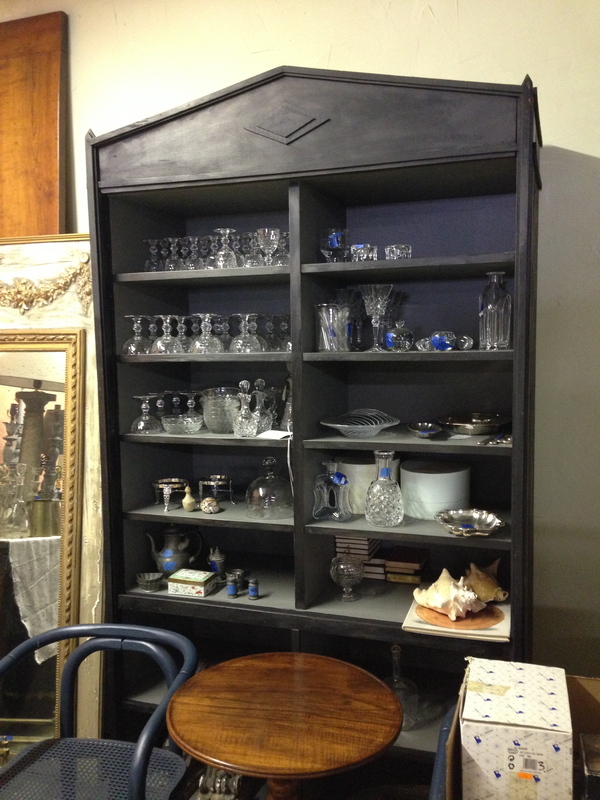 Boldly scaled and painted black, this mid-century Directoire style cupboard would be great in a modern white kitchen as a contrasting freestanding storage piece. It’s a great way to showcase colorful collections, or masses of crystal or glass barware, as shown here. I’m really hoping for another Egyptian Revival in the near future – the style and motifs of ancient Egypt are fascinating to me. These prints would look incredible in a foyer with a bold wall color or pattern, hung as a pair vertically or horizontally over a console table or bench. I just died and went to Chinese Chippendale heaven. 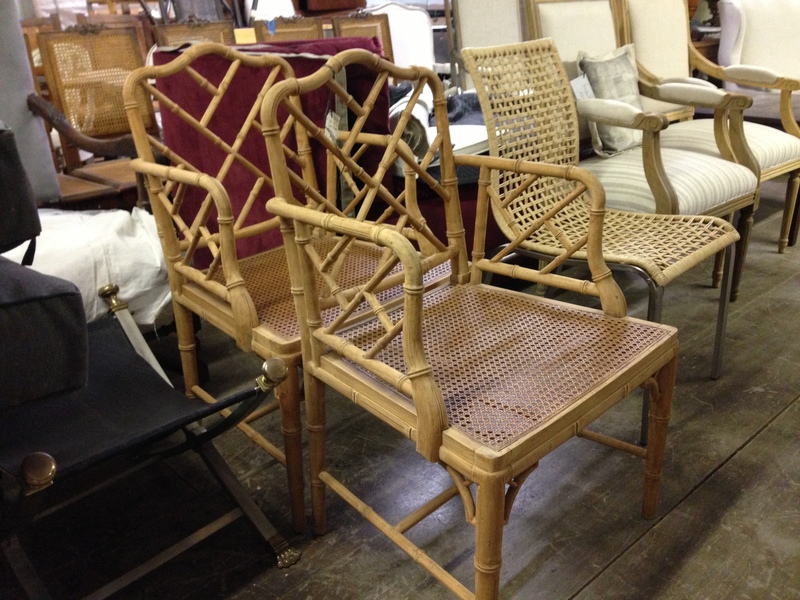 These vintage faux bamboo chairs with caned seats are a design classic, and how lucky to find them as a pair, and in such great condition. I would have snapped these up for my office in a heartbeat, had I not already bought something similar brand new. So many amazing chairs here! My big purchase of the day was this gilded black Federal style mirror. It 100% belongs in my house, I’m just not 100% sure where I will put it! I’m sure I’ll figure it out when we get home. Doesn’t it have great lines? By the way – a note to my readers with kids: if you love antiques but are not sure how to safely incorporate them into your home, your walls, (upper) bookcases and mantlepieces are a great place to start. You can work your way down to the floor for those fragile items when the children are a bit older. 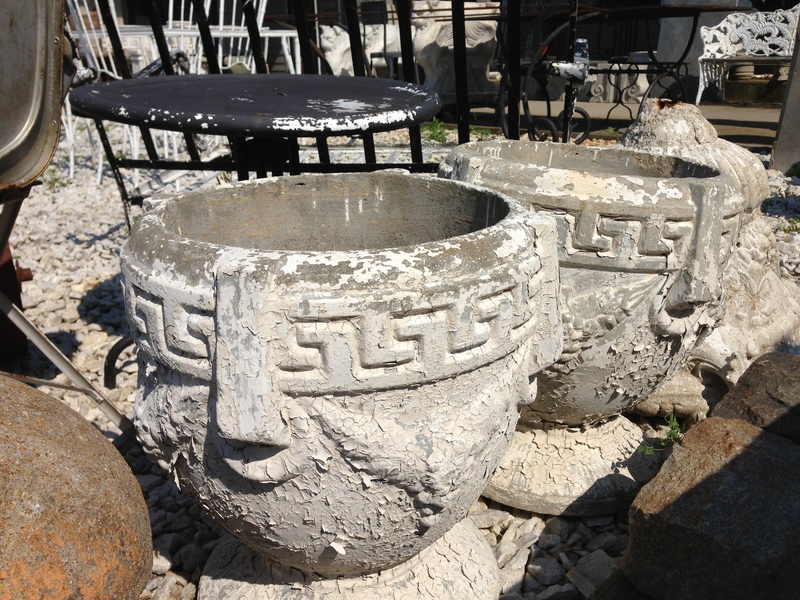 I am pretty sure these belong on my front porch, but I’m still thinking about it. Fabulous cleaned up with a fresh coat of paint (maybe high gloss black, or dark blue??). 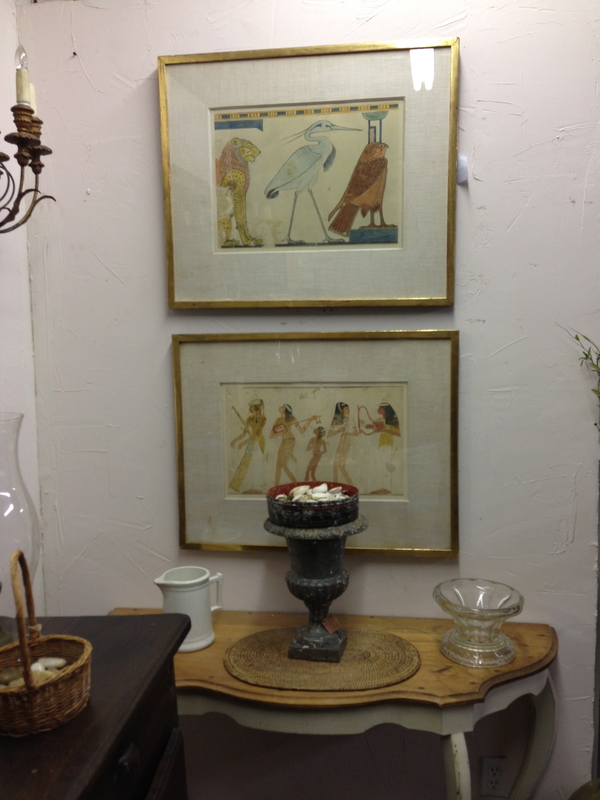 I been to Berkshire Home & Antiques many times. 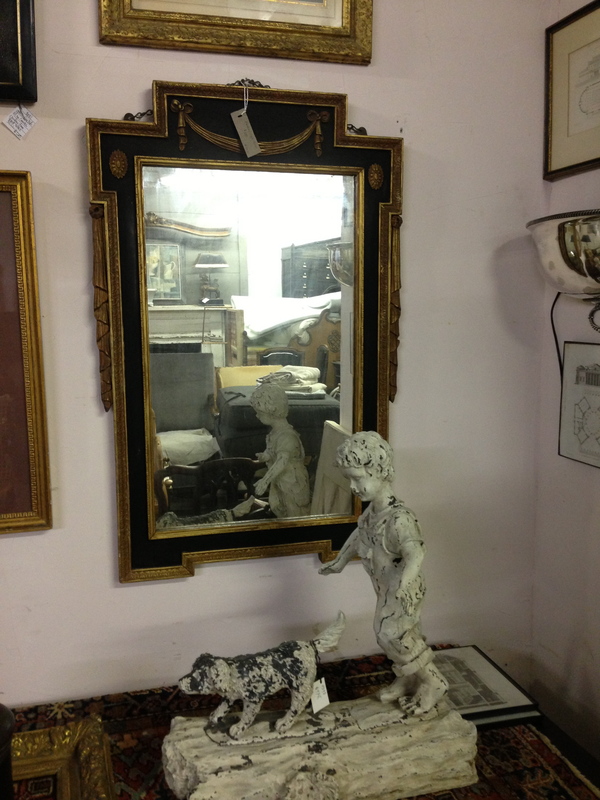 It’s one of the area’s best antique shops because of its huge selection of antiques and furnishings from the 17th century to midcentury modern and so much more. Nothing like it around! Owner Vivian Kimmelman is also on hand to advise on any decorating questions. I agree, Thomas – Vivian’s store is totally unique, as is her desire to work with customers to modify things to fit their style and decor. 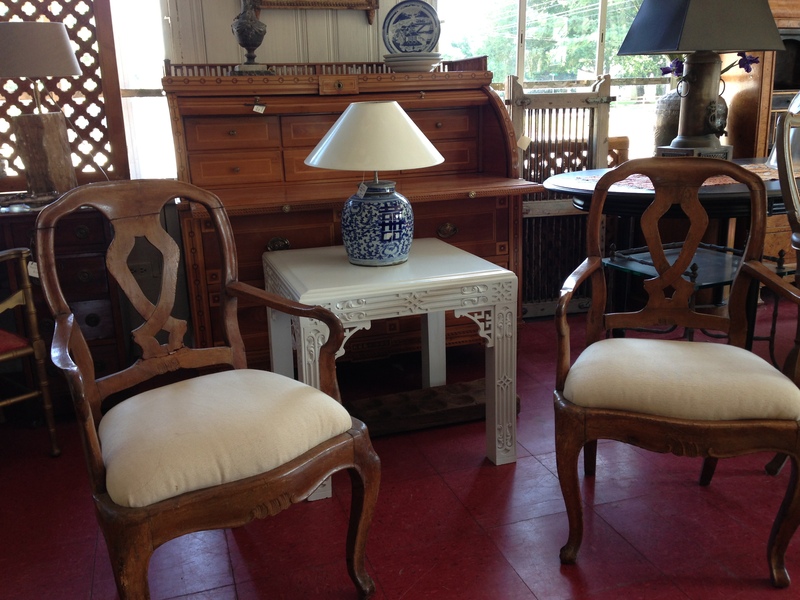 Painting, refinishing, reupholstery, etc. And I love that they enjoy creating custom, one-of-a-kind pieces, as well. Thanks for your comment!